I've started a page on my site dedicated to software for software running on other operating systems which are directly or indirectly useful to QL users running emulators, for example. The most obvious software to include is file transfer stuff. The page was inspired by ToFro's suggestion about the JoyToBas PC joystick to keypress conversions software for PCs, which of course makes it easier to run QL games etc on emulators where the QL game control is via cursor emulating joystick or mouse of course. Much of the software on the page initially is already on my site, scattered across several pages, so this page brings it together with links to the relevant pages to make it easier to find things. If anyone has suggestions for software to include here, let me know, I'll see if I can stuff as time and relevance permits. To Do: Unfortunately the 2 *.ini-Files delivered with char convert to translate to/from QDOS/Windows do not include all characters, but you can add the missing characters in the *.ini-files with an Editor application which supports ANSI-encoding. Unfortunately currently only 8-Bit character sets are supported, no Unicode(!). Allow to convert files in subdirectories recursively (currently subdirs are just skipped). WARNING: Interactive changes made in the translation table (right bottom) ARE LOST WHEN THE PROGRAM IS CLOSED(!). Use an *.ini file to make those changes permanent. This program replaces arbitrary characters (no strings) in files with arbitrary strings. It has an HTML mode in which it ignores (replaces nothing) anything between the HTML tag delimiters (< and >). Therefore, it is ideal for replacing German umlauts and special characters such as 'ä' with the corresponding HTML name (&auml;). This is no longer necessary with most web servers if they load the files directly. But if you import files via PHP, real umlauts are not displayed. With charConvert you can quickly convert an entire directory with HTML-specific files in a single pass. I did the same with this website when I changed it from frames to CSS (Cascaded Style Sheets). Since version 1.1 also the line end characters can be converted, so you can e.g. convert files from/to foreign operating systems. Two *.ini files for the conversion from/to QDOS (multitasking operating system of Sinclair QLs) are included. The actual processing routine runs in its own thread. I.e. while the app is running (converting), you can already select the files in another directory. (Note, This will only be noticed with huge directories. Normal directories like my htdocs directory are completely processed in a fraction of a second. If errors occur (e.g. 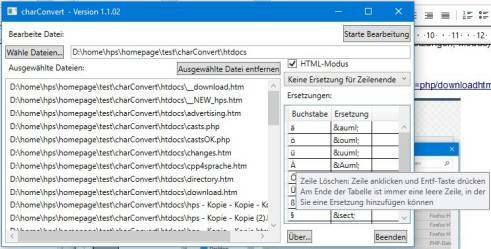 file could not be changed because it is write-protected), these files are displayed in another modal window after the conversion thread has finished. At startup the program reads the file charConvert.ini if it is located in the same directory as charConvert.exe. Attention this does not work when starting from some alternative file managers, e.g. Q-Dir (corrected from Q-Dir version 6.46). With the Windows File Explorer there are no problems (with the call option " -ini IniDateiname.ini" a file can also be specified). In this file (an example file with detailed explanations in the comments is included in the archive) you can make various default settings, which are evaluated at program start. "charConvert.ini" can be edited/created with any text editor like e.g. the "Editor" of Windows (Notepad.exe), text coding must be "ANSI" (default), but not with a text program like Word. 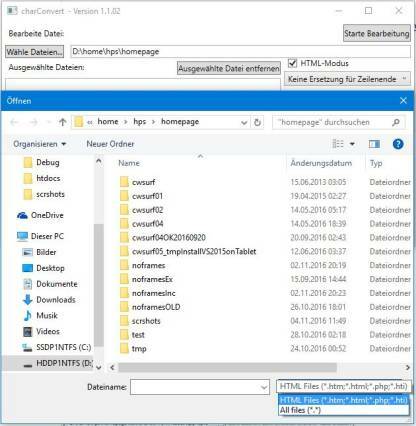 In the directory charConvert.exe where charConvert.exe is stored, there must be a subdirectory named "de-DE" in which the file "charConvert.resources.dll" (with the German texts) must be located. Otherwise the program only "speaks" English. Important: At the moment charConvert can only process files with ANSI coding correctly, with UTF-8 coded files many special characters do not work, e.g. the paragraph character '§'(!). The program was tested so far only under Windows 10, the .NET Framework 4.0 is necessary in any case. Under my remaining Windows XP computer, it does not run. There is also the source code again. Since in Visual Studio (I use VS 2015, latest version) references are necessary, I uploaded the complete "workbook" with all directories including the executable file. So you should be able to open the charConvert.sln directly in Visual Studio. Git is already installed (of course you have to have Git installed on your system).